Announcement Welcome to Karmabee* and thanks for supporting independent artists! My baby clothes, kids & adults tees, notecards, coasters, washi tape & gifts feature prints of my original hand-drawn black & white designs (doodles!). 100% cotton clothing is available in a variety of colors in baby one-piece bodysuits (size 6-12 mos) which are great for baby shower gifts, and kids tees (sizes 2-6). Men's and women's t-sizes available too! 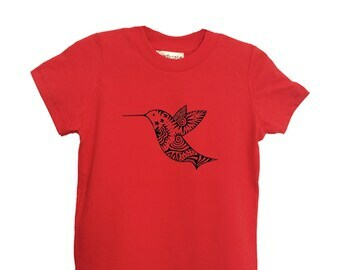 I screenprint the clothes myself and they are fully machine-washable. Notecards are blank inside and come with envelopes, individually or in sets of 10 made from any designs in my shop. If you would like to receive my quarterly newsletter, please message me or sign-up on www.karmabee.com. *What does Karmabee mean? The name is a combination of me and my sister's first names and our last name. Conveniently, I believe in karma, and bees are helpful, community-oriented, and produce something sweet! Welcome to Karmabee* and thanks for supporting independent artists! My baby clothes, kids & adults tees, notecards, coasters, washi tape & gifts feature prints of my original hand-drawn black & white designs (doodles!). Wonderful cards - I know recipients will greatly enjoy! The informal screenprinting set-up in my studio. Karmabee brick & mortar store in Kingston, NY. With Karmabee's trusty greeter, Annie. In my studio, testing out the new Karmabee temporary tattoos. Screenprinted baby onesies & tees laid out to dry before heat-setting. In school my notes were buried between expanding margins of faces & shapes, and throughout 12 years of an international development career, my notepads were covered with spirals & eyeballs. In 2007, I went to work at a holistic institute, and found that when my brain was distracted by wacky esoteric discussions, my drawings got more inspired. A friend gave me a set of make-your-own postcards, and when people commented on them, I ventured into a local arts fair, and began printing my designs on notecards. At the time I also sold photos of mine and my sister's, and named the new enterprise Karmabee, a combination of our names. When I realized how much I enjoyed running my little business, I expanded into silkscreening my designs on baby clothes and kids tees, doing custom logos, selling in local stores, and printing my designs on whatever else I could think of. From 2011-2016, I ran my own studio and store in Kingston, NY, and currently sell my work at local markets, stores and online, continuing to doodle whenever I can! Welcome to Karmabee! I'm Karen and I'm a doodler. Originally from South Africa, I lived and worked in California, Costa Rica & Washington DC before settling in the beautiful Hudson Valley, NY, where I run my small studio and Etsy shop. Worked with me as a freelance designer to create and manufacture washi tape. All items are made by me in my studio and shop in Kingston, NY. I hand draw the designs with a Sharpie, create and print notecards, and silkscreen designs onto baby clothes, and kids and adult tees. All clothes are printed and stored in a smoke-free and cat-free (but not dog-free!) environment. I'm happy to work with customers on a case-by-case basis for cancellations, returns or exchanges. Please contact me within one week of delivery. Customer pays shipping. I accept credit cards and PayPal. (Local folks can pay in cash or check and get personal delivery!) NY residents will be charged sales tax. Domestic orders are mailed via USPS First Class within 2 days of receipt of payment. International orders are mailed via First Class International within 2 days of receipt of payment.. Import duties, taxes, and customs charges are not included in the item price or shipping charges and are the responsibility of the buyer. I often include free cards, stickers and/or coupons, so look out for goodies. Onesies are size 6-12 mos which is perfect for newborns up to 1 year-olds. For big babies or 1-2 yr olds, I recommend kids size 2. Adult women's tees run small. Adult unisex tees are standard adult sizes. All clothes are silkscreened and heat set for safe laundering. I recommend air-drying to prevent shrinking in the dryer. Drawings: I love creating custom designs and logos - contact me for pricing! CARD SETS: Custom notecard sets are available at no extra charge. Send me a photo of someone modeling Karmabee-wear, and if I use it (with your permission), I'll send you a free set of notecards!